Can Comenta.TV bring TV's second screeners to a single platform? Americans are using Internet and TV together more and more, according to a recent study. 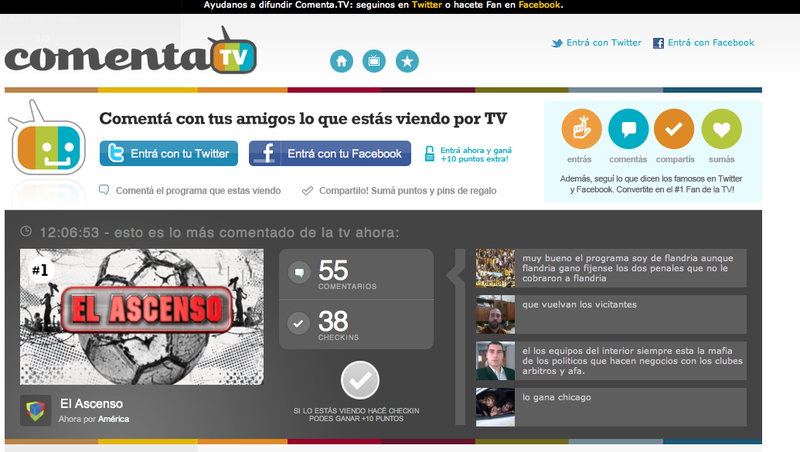 The same “second screen” phenomenon is happening in Latin America: TV viewers live-comment the shows they are watching. Here is how newly launched startup Comenta.TV plans to tap into this new segment. Launched only a couple weeks ago, Comenta.TV is a web platform that aggregates and organizes in real time all comments made on social networks around live Argentine TV programs, thanks to a tailored algorithm. For users who sign up via Twitter and Facebook, it includes social, check-in and gamification elements: they can connect with their online friends, share what they are viewing and earn badges. According to its CEO Juan Melano, his team had been working on Comenta.TV for five months before it launched, and was determined to make its product available as soon as possible in order to be the first player in Latin America: it doesn’t have any local competitors yet. In the US, the most similar company would be SocialGuide. Products such as GetGlue and Miso are also close, but more focused on the check-in dimension than Comenta.TV. Juan’s idea was to tap into a phenomenon that had already started. More and more, Argentines are commenting TV programs on a second screen while watching; although no numbers are available yet, the penetration of social networks is very high in Latin America. He decided to team up with his former colleague Gustavo Vilgré La Madrid to develop an algorithm that could aggregate these comments in real time and make this experience easier. Gustavo’s background was highly relevant: he studied Computer Science, is a developer worked on web real time such as Big Brother Spain and Argentina – a good complement to Juan’s media- and design-oriented profile. The small team also counts a third member, Fernanda Menduiño, acting as a producer and identifying potential partnerships. Juan says he believes in small teams, where he comes from, but thinks that the staff will soon need to grow to 6-7 people. Partnerships will be crucial to Comenta.TV: its business model is based on data analytics, rather than page views. Knowing what people think of a show in real time and who they are could be highly valuable for production companies, networks and advertisers – Comenta.TV sees all of these as potential clients. The consumer experience is also monetizable, in a more creative way than through banner advertising; for instance, a brand could sponsor specific badges linked to special events that don’t happen very often, such as the World Cup. Juan is determined to make the platform as user-friendly as possible. He explained to me that it’s the reason why it’s using so much Ajax, which makes the experience faster and more fluid. Comenta.TV is also user-centered in the sense that it’s learning from the actual user experience to keep on improving its product – Juan Melano describes his company as a lean startup that will go from small to big. At the moment, its promotion is only based on word-of-mouth, attracting 7,000 users a day, but it’s ready to scale when the time comes. Hosted in a cloud computing environment provided by Vurbia.com, it already indexed 3m comments and aggregates 50k a day. As for finances, the company is currently bootstrapped and isn’t actively seeking investors at the moment; these might be needed later on when the company expands to new markets. Comenta.TV’s key concept is to make TV a social experience again, according to a recent post on the company’s blog: in Juan’s view, TV was a group experience when it started, with people watching it together. Then screens became more and more individual, but the social networks and platforms can bring back this social layer. The difference between live-tweeting and commenting on Comenta.TV is that the experience won’t be limited to a single hashtag: during a football game, it will also following comments regarding a specific player, bringing back the context that hashtags tend to lose. At the moment, the TV experience is going through a transition, and Comenta.TV knows it has to go beyond the laptop. Mobile is crucial to its strategy and apps are in the works, for Android, iOS but also Blackberry devices, which are quite popular in Latin America. As for the iPad and other tablets, Juan also considers them to be very important but doesn’t plan to develop a specific app: Comenta.TV will be browser-based. The platform has been developed in a way that makes the transition to HTML5 very easy, but it didn’t fully migrate yet because all browsers aren’t ready. As for connected TVs, their penetration in Latin America is still low, making them a long-term target rather than a short-term need. Interestingly, Comenta.TV was one of the companies selected to pitch at the Demo Pit organized by Palermo Valley during GeeksOnaPlane’s trip to Latin America (see our previous story “What happens when GeeksOnaPlane fly to Latin America“). It wasn’t the company’s first contact with the Silicon Valley: it had participated in Palermo Valley’s trip to California in October 2010. During their stay, 40 Argentine entrepreneurs from over 30 ventures had visited companies such as Facebook, LinkedIn, Twitter and Google, and networked with many Silicon Valley’s executives. However, the GeeksOnaPlane’s experience was even richer according to Juan: they learnt even more in a very limited time, and without having to go places. 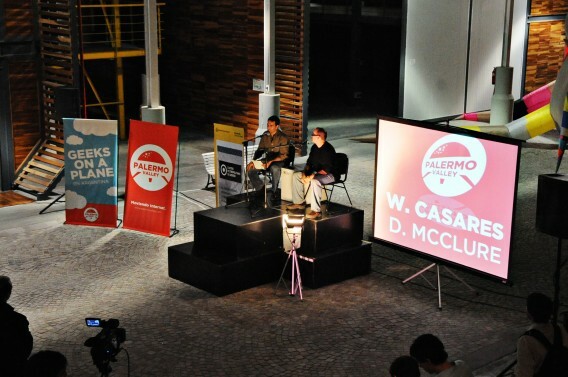 The fact that the Geeks came to Argentina was also perceived as a huge recognition, and the local startups felt validated by people they admire. It also meant that Palermo Valley had managed to put Argentina on the map – something very important to Juan, who volunteered as a facilitator at Palermo Valley for a couple years. The term “Palermo Valley” was coined as a joke: Palermo is a neighborhood in Buenos Aires where many tech companies are based, although many are also based elsewhere in the city. More than a specific place, it refers to the very successful networking community created 4 years ago. 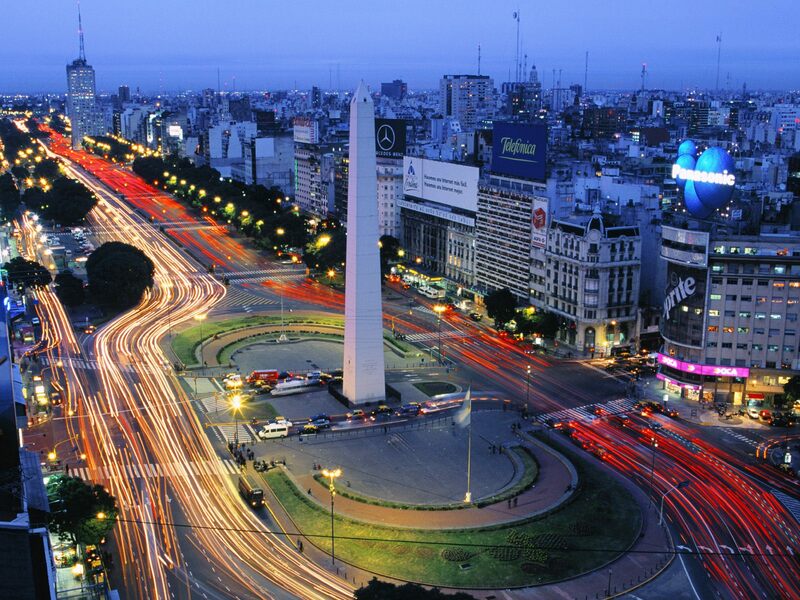 At the time it was launched, there were many entrepreneurs and tech workers in Buenos Aires but they didn’t know each other. Thanks to networking events gathering up to 600 people, Palermo Valley managed to create a real community. Since then, it was replicated in many places, from Lima to Costa Rica. Palermo Valley’s Demo Pit gave companies such as Comenta.TV an opportunity to pitch to the GeeksOnaPlane and get very useful feedback. Many of the comments had to do with presentation, since Argentine companies have less pitching experience. ComentaTV was also given food for thought: many asked why the company would limit itself to the TV segment since its technology could be applied to anything. Juan thought about it carefully, but decided it was a strategic decision to focus on a single segment, at least for the moment. The Geeks’ experience also made him even more determined to launch first and fast, leading to ComentaTV’s release a couple weeks later. What do you think? Do you know other recently launched Latin American startups with global ambitions?